What criteria does a target stick need to meet to be a ‘good’ one? That depends on personal preference. In this post I will tell you what I think is important about a target stick. I’ve seen all kinds of objects and DIY target sticks for horses on the internet, some look safe others don’t, some look handy others don’t. If you want to know how a target stick is used, read this post. I made my own target stick. I have experimented with different materials over the years and this is the one that I like the most, see picture on the right. I prefer a solid lightweight target stick. This is important because you can hold a lightweight stick longer in your hands before getting tired. You can also work more accurately if the stick is rigid. If your target stick is too flimsy it may bend at the wrong moment and you don’t want to bump your horses sensitive body by accident. A flimsy target is harder to hold still. 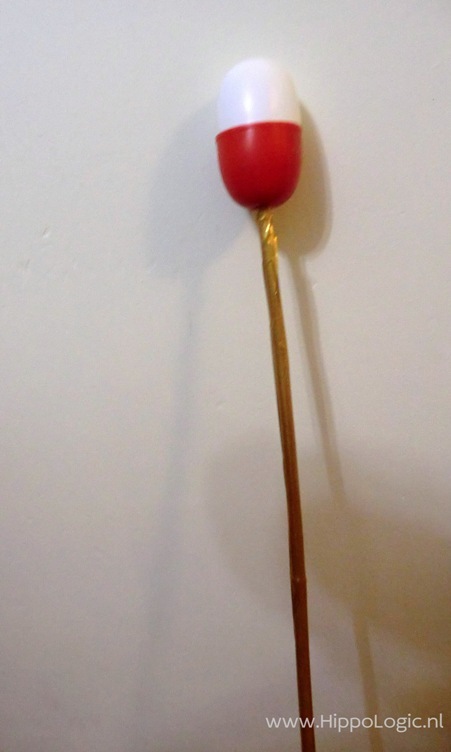 I made a special lightweight target stick for my son: a soft floater glued to a whip. For this goal: working with a clicker savvy horse and only asking the horse to touch it with the nose, just to make a picture it was OK. I would not recommend it in other situations: too flimsy and inaccurate. The target at the end of the stick has to be safe. I choose to use a floater of hard plastic so horses can’t get a grip on it if they are exploring the target stick with their lips and or teeth. I use duct tape around the bamboo stick, to prevent splinters. Tennis balls on whips or sticks or soft floaters/pool noodles are not safe if you work with mouthy horses. 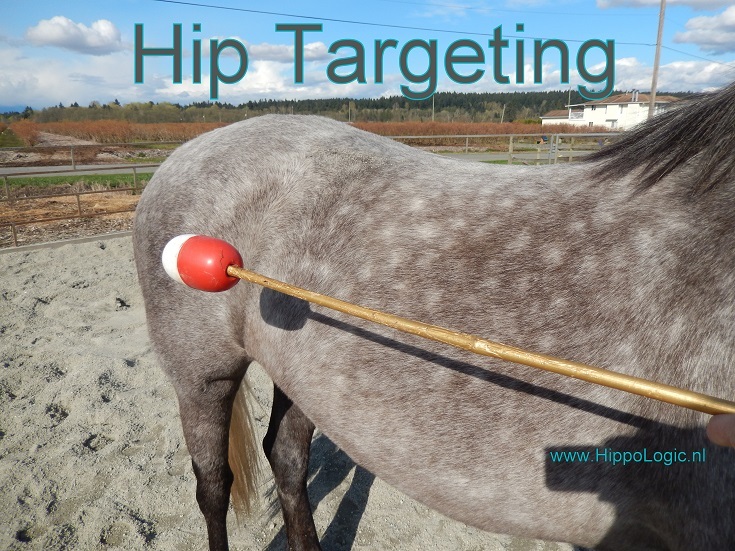 I want my target stick to have a convenient length: long enough to use it to target my horses hips if I stand near the head and long enough to work with the horse while working with a protective barrier between us. But also short enough not to become too heavy after a while. You need to be able to use the target stick easily in one hand without getting tired. The target must be easy to discriminate from the stick. It will be easier for the horse to see it and understand that it is only touching the target at the end of the stick that will earn him treats. 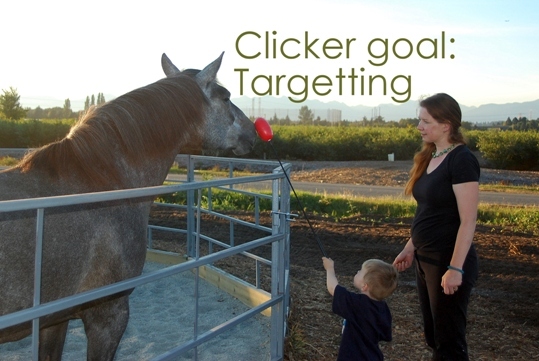 An obvious target makes it also easier for the trainer to have clear criteria what to reward and what to ignore.. One of the goals of using a target stick is to create distance, so the horse has to learn to touch the end. That is why you put a target on a stick. 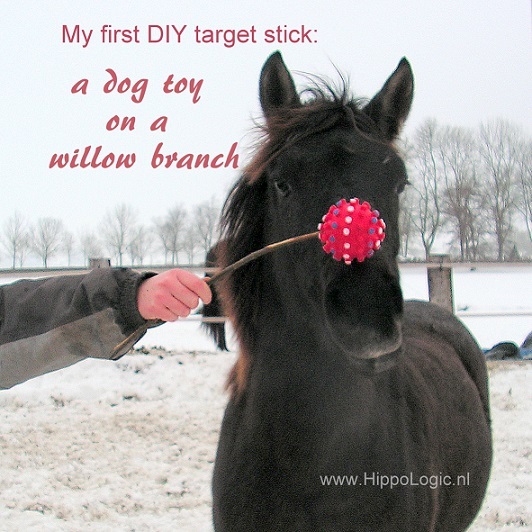 If the horse can’t distinguish the target from the stick, you are missing the point of this tool. Choose a target that is big enough to notice and get touched by the horse, but small enough to be light and easy to work with. The smaller the target the easier it is to store and to take with you. You want to invest in a stick that lasts for years. If your target stick is easy to use, you will use it often. You get used to it and therefor you want quality. That quality doesn’t have to be expensive as you can see with my target stick. I am curious what you use as target stick. Did you buy one, or do you use an existing object (like a tennis racket) as your target stick or did you make one yourself like I did? Please share your ideas.